Saas Fee has always been a firm favourite of ours thanks to its charming, traditional village feel, snow sure slopes, year-round appeal and dramatic peaks. Now it seems others are beginning to catch up, as holiday makers and investors alike realise what an ideal ski destination Saas Fee has become. Here’s a quick look at how this relatively unknown corner of the Alps was discovered and the many positive effects its new-found fame is having on the highest ski resort in Switzerland. The dramatic change began in 2016 with the introduction of the WinterCARD Gold. Saas Fee offered season long lift passes for just CHF 222 if 99,999 people signed up for it. They hit their target and attracted a huge number of new tourists to the area, increasing their visitor numbers by 15%. The pass covered not only Saas Fee, but also the neighbouring areas of Saas Grund, Saas Almagell and Saas Balen. The card even offered several discounts on a variety of facilities within the resort including ski hire, hotels and restaurants. Having been such a huge success the offer has continued for the following seasons. Unfortunately, the deadline for this year was the 4th November, but make sure not to miss out for the 2019/20 season! With this recent and impressive increase in visitors, Saas Fee has since seen a variety of very positive effects. The first is that local business owners noticed that Saas Fee suddenly had a lot more visitors, and they quickly realised they’d have to move fast to capitalise on the increase in potential customers. What followed was a sort of localised arms race as the owners of bars, shops and restaurants all rapidly improved their establishments in order to attract more of these new faces. The result is that Saas Fee now boasts some great bars near the lifts for lively après-ski, some more sophisticated restaurants and new shops too which all add to the village’s appeal. Some resorts can get stuck in the past leaving visitors with little or mostly poor options when it comes to entertainment. Saas Fee has reacted to its new-found popularity and has in managed to further enhance its status. The commune of Saas Fee have helped too by completely renovating the aqua centre and building a new youth hostel to encourage people of all ages to come and discover the resort, People have more reasons than just a cheap ski pass to come back next season. There is also a lot to do in this quant dual season resort – it’s not just about skiing. Some hotel owners have upgraded their hotels to attract more guests. Others, like the Hotel Britannia are turning their historic building into apartments, taking an apartment themselves for their retirement and selling the others to locals and foreigners. Outside investors have also spotted this strong emerging market. A Swedish company has bought a number of hotels with plans to renovate and sell them on as holiday apartments. They will also rent and manage your apartment for you and aim to bring a new higher level of service to the resort. 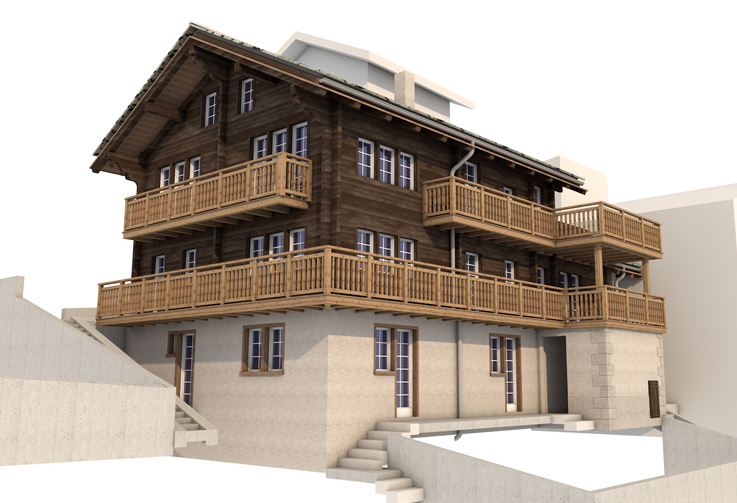 The property market is beginning to move very fast in Saas Fee and most of the new apartments were snapped up within just a few weeks. None of this is new construction, which could potentially spoil this charming, quaint village. It is simply improving what’s already there and at the same time securing more visitors for the future. With the increase in visitors and buyers to Saas Fee, it’s no surprise that property prices are heading in the same direction. However I don’t think anyone was expecting them to rise quite as much as they have. UBS recently carried out some research on property prices in the Swiss Alps and, as you can see below, Saas Fee leads the way with a huge 14.3% increase in the last year. Despite the rise, prices are still much more reasonable than some of the other major resorts such as Verbier, Zermatt, St Moritz and Gstaad. Showing you don’t need to pay over the odds to buy in a highly rated Swiss resort. The most recent development, and the most convincing evidence that Saas Fee is attracting much wider attention, is that the lift company is currently being bought out by Peter Schrocksnadel, CEO of the Schrocksnadel Group. The successful businessman and President of the Austrian Ski Association has purchased 29% of the company’s shares, with a view to own 51% within two years. Dubbed by some the “Ski Napoleon”, he already owns a number of lift companies across Austria. As well as improving Saas Fee as a summer destination, including the construction of a new bike park, he is also planning to invest heavily into the lift system, further upgrading the resort’s infrastructure. With an initial injection of CHF 12m, the locals are hoping this will lead to new, faster lifts and maybe even the long-discussed introduction of a lift linking down to Saas-Almagell. These improvements have been both desired and necessary for many years, however now the lift company has the capital and the backing to implement them. Since the introduction of the WinterCARD Gold, Saas Fee has been going from strength to strength. Now two years later, not only is its rise showing no signs of slowing down, but thanks to new investors and a dynamic new lift company operator, it looks like its rapid ascendancy is going to continue for many years to come. Somehow, this 14th century farming village has been transformed into the one of the hottest investment prospects in the Alps.